When the tide goes out – up come London’s buried memories | London My London | One-stop base to start exploring the most exciting city in the world. If the Thames is the bit of London that most Londoners take for granted then the Thames foreshore is the bit they would also take for granted if only they knew it was there. That may sound cynical but there is no doubt that the foreshore is the most forgotten part of the city. Which is a pity because it is the curator of London’s memories going back over the centuries, an organic museum which changes every day in response to wind and tide. 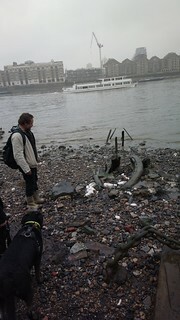 We were lucky today to have the company of three Museum of London archaeologists working with the Thames Discovery project (Twitter @ThamesDiscovery) who opened our eyes to some little known facts about the foreshore at Rotherhithe (Think Mayflower and Angel pubs). Rotherhithe was not long ago a centre for ship breaking. Ships passed their sail-by dates from Turner’s Fighting Temeraire downwards came here to be broken up, recycled and sold to the highest bidder. 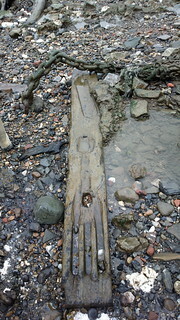 Many of the timbers were used to build causeways and platforms (see photo above) with Victorian timbers so strong they are still embedded in the foreshore surrounded by hundreds and hundreds of nails. 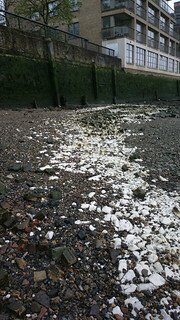 Big patches of white (below) turn out to be chalk imported to provide a flat surface for the boats while round yellowy stones were once London bricks sculpted by time and tide. Most of the shingle that populates the banks turns out to have been deposited there by humans as are many of the stones ejected from ships to create space for the return journey. 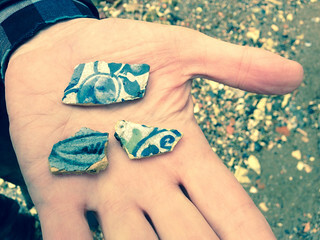 We found 17th century pipes of the kind Sir Walter Raleigh would have used and bits of Delf pottery (below) from a little later probably surplus to requirements from nearby potteries. 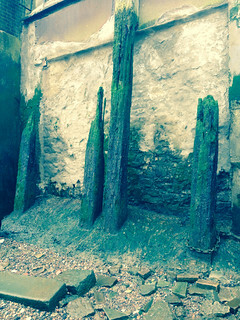 We were shown part of the causeway opposite Wapping Steps (above, left) and a rare section of a medieval wall on the foreshore (above, middle). Our archaeologists had amazing knowledge but even they were stumped, if that’s the right word, by the piece of timber (below, left). They can’t figure out what those slots are for at the front. Can you? 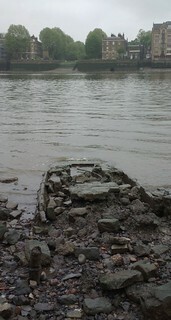 They left us with a tantalising glimpse of a site nearer Tower Bridge where neo-lithic remains are thought to reside. We will probably have to wait until the Thames sewage tunnel reaches here when a fresh archaeological dig is likely.